The third DevOps Enterprise Summit was recently held in San Francisco. 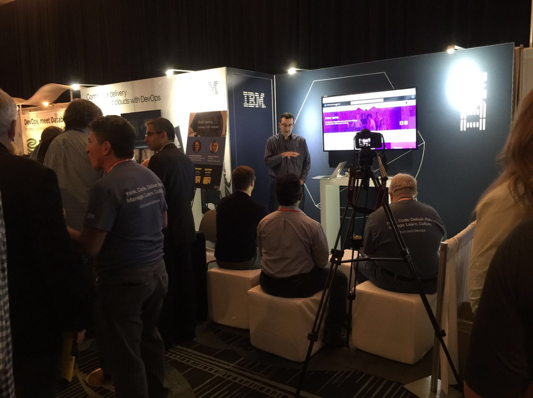 In this article, Steven Weaver from IBM details his experience there. 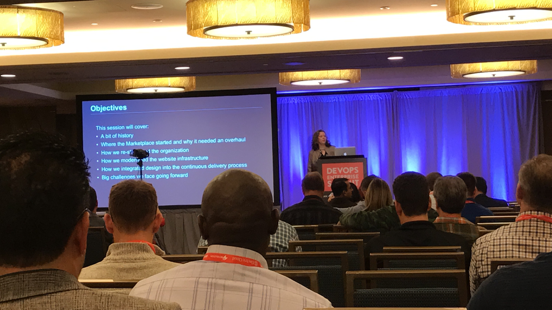 Last week, the third DevOps Enterprise Summit was held in San Francisco. Like previous years, the focus was on how large enterprises are adopting DevOps practices and tools to address business challenges. It’s always interesting to hear how adoption efforts are progressing, and it’s clear that we’ve come a long way in just the short time since the conference was founded – we’re moving well beyond the pilot “two-pizza” teams of years past, and companies are looking to scale their initial, successful forays into DevOps and expand the blueprint of small, Agile, co-located teams to the wider enterprise. At the IBM booth, we had many deep discussions about best practices and technology, and it’s clear that while the future may look increasingly cloud-like, many businesses are focused on enabling DevOps teams for on-premise or hybrid development too. Increasingly, DevOps practices are being used on complex, multi-platform applications that span existing enterprise systems, cloud, mobile and IoT. 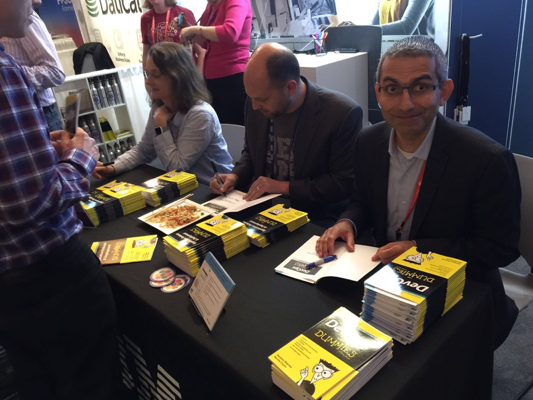 Booth activity: Book signings and lightning talks in the IBM Booth at DOES 2016. Illustrating this trend, some great examples of this shift to hybrid DevOps were given by IBM customers at the conference. Walmart, for example, discussed how they built a set of services on the mainframe to provide capabilities at a large scale for their distributed teams, as well as discussed the transformation required for mainframe teams to achieve this success. IBM is also working with Walmart and Rocket Software to provide the source code for these services on GitHub, making the mainframe an integral part of today’s development efforts. Rosalind Radcliffe (IBM) and Rich Jackson (Walmart) discuss DevOps on the mainframe at DOES 2016. NBCUniversal also discussed how they’ve adopted a DevOps approach to application development across their complex enterprise, consisting of 17 business units, in order to improve code quality, streamline development, and lower costs. Using IBM UrbanCode and IBM Development and Test Environment Services to drive DevOps, they’re combining continuous integration, delivery, testing, feedback, and monitoring into one automated workflow, have seen a 75% reduction in time required for new application releases, and have decreased regression testing time from weeks to hours. 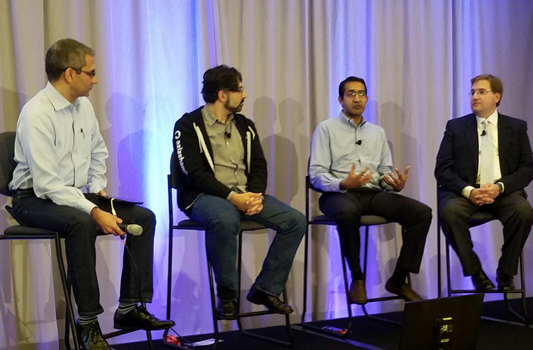 Sanjeev Sharma (IBM), Aziz Shamim (GitHub), Raghunath Raman (Kaiser Permanente) and John Comas (NBCUniversal) discuss DevOps on a panel at DOES 2016. Finally, at IBM, we’re deep into our own DevOps transformation, and during our session at DOES on adopting the squad model in the IBM Marketplace development team, we highlighted the key steps we’ve taken in extending DevOps practices across more than 75 squads, adopting practices like Lean, Agile, and Design Thinking while moving towards rapid (five to 20 minute) zero-downtime deployments for complex, hybrid environments. Many of the practices adopted by these and other enterprises are encapsulated in the IBM Bluemix Garage Method, announced last year at DOES, and extended further this year with new tracks, reference architectures, learning modules, and toolchain guidance. In fact, this year at the conference, we introduced IBM Bluemix Continuous Delivery, which helps enterprises accelerate transformation with an integrated toolchain that supports development, deployment, and operations tasks. 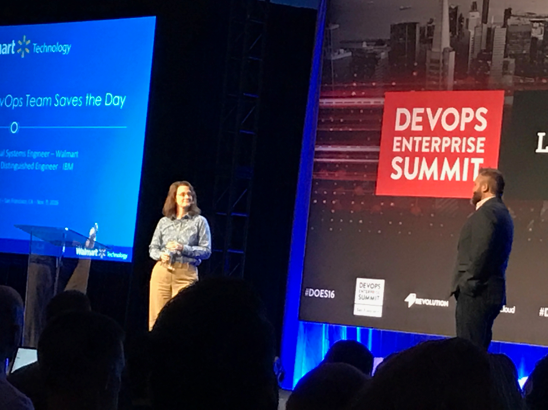 We’re excited by the growth of DevOps in enterprises and look forward to hearing how companies are progressing their adoption of DevOps at scale at next year’s DevOps Enterprise Summit. See you there! To hear more about these stories and others, sign up for the upcoming DevOps.com webinar Adopting DevOps at Scale: Lessons learned at Hertz, Kaiser Permanente and IBM on November 29.